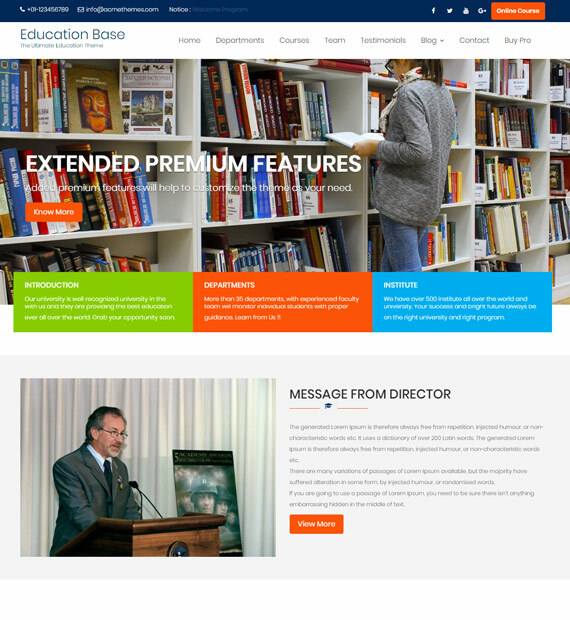 Education Base is a free responsive WordPress theme by Catch Themes that is perfect for any type of websites related to education institutions. The flexible, clean and modern touch with the professional looking layout is one that certainly makes your site look more attractive to your users. The integrated advanced features along with the easy drag and drop builder help even the amateurs create stunning websites easily. Adding to it, you will also get integrated social icons as well as easily customizable options. Add beautifully crafted forums and discussion board with great attention to details to your WordPress site easily and increase the user interaction and help out users. Get communicating today! Get more sharper and clear image and resolution on your website thanks to the retina ready display that shows more pixels per square inch!